Welcome to the Stewart Rate Calculator Training Center! We hope you find the information on this page useful as you begin or continue to use The Stewart Rate Calculator. Here you can find important Announcements, a look at commonly asked questions in the Did You Know section and Self-Paced Learning resources that help make the transition to Stewart Rate Calculator easier. The new and improved Stewart Rate Calculator (SRC) launched on November 15, 2018. 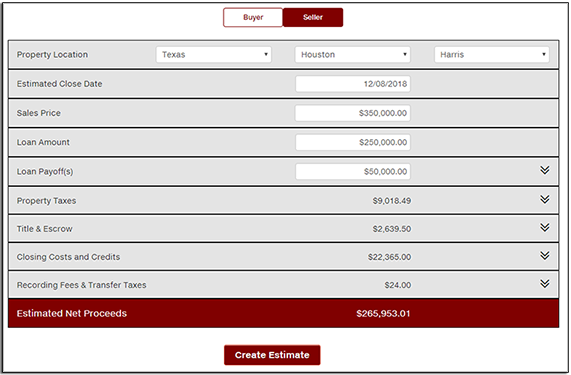 With this release users will now experience a more modern look and feel for Stewart Rate Calculator's (SRC) Buyer's/Seller's Net Sheet with fewer keystrokes, less scrolling, and the ability to get real time estimates-- enabling you to more quickly request a Net Sheet estimate. A clean, more modern interface allows for quicker Net Sheets with fewer keystrokes. Consistent with other SRC tools, but new for the Buyer/Seller Net Sheet -integration with Ernst for more accurate amounts for recording fees and transfer taxes. Over the past several months, you may have been introduced to Stewart Now (both the mobile app and the website). You may be curious about what each calculator does and where they obtain their data. Each calculator uses the same single source of data, and this latest release of Stewart Rate Calculator will bring us one step closer to our end goal of aligning all rate calculators with the same response, no matter which calculator you use. Stewart’s Microsites: Your direct operations websites will be automatically updated. You’ll find the new tools at the same place - under Tools and Resources > Calculators > Seller Net Sheet (or Buyer Cost Sheet). Stewart Now Website: When you choose an Absolute Net Sheet from within the Stewart Now Website, you will now experience the new Buyer's/Seller's Net Sheet from Stewart Rate Calculator. Stewart Now Mobile App: Be on the lookout for a new version coming soon. You may be familiar with other Stewart calculators and are curious about what each calculator does and where they obtain their rate information. Some of these calculators will be enhanced while others will be retired. In the future, all calculators will use the same single source of data, and this latest release of Stewart Rate Calculator brings us one step closer to our end goal of aligning all rate calculators with the same response, no matter which you use. If you have placed a Stewart Rate Calculator link on your website, there’s nothing for you to do! The new calculator will update automatically. As a Stewart Trusted Provider™, we'll also personalize the results with your logo and the Stewart Trusted Provider logo. If you have the older Net Sheet links on your site, we’ll contact you soon about updating the links. Stewart’s Websites: When visiting www.Stewart.com, you have the ability to calculate title premium. Even though this tool doesn’t provide Net Sheet capabilities, it will also benefit from the recent enhancements. For the latest in training and to become more familiar with these new features, please see the Stewart Rate Calculator Interactive Learning Guide in the Overview section of Self-Paced Learning. For immediate training or a refresher on a specific topic, refer to the following training resources. Learn more about each release by reading the Release Notes or Release Communications in the Releases section below. The Stewart Rate Calculator is a tool that streamlines the quote process, making it quicker and easier for users to create and generate customer quotes. Read through Release Notes or Release Communications to learn about everything included in the release. Click the version you want to view or print. For further assistance with Stewart Rate Calculator, please send an email to the Enterprise Pricing Solutions Team.